Just where the commercial zone ended at the outskirts of the village, the road became optimized for car traffic. While there were sidewalks all along the road within the limits of the long stretched settlement of Aufenau, here were only crash barriers. Cars rushed along the modern road at or above the allowed limit of 100 km/h. What’s more, the roaring Autobahn lay only 100 meters away up the hill. This stretch of the old road from Frankfurt to Leipzig along the Kinzig valley was no longer suitable for pedestrians. While preparing the walk, I had spotted something on the map that I wanted to reach before I was willing to turn away from this road. It was a couple hundred meters ahead and I took a muddy farm track next to the road to get there. Arriving at the designated spot, there was a stone column next to the road indicating the border between two districts. This was not what I was looking for even though my GPS confirmed the position. Then I spotted the Stundensäule on the other side of the road. It was covered with thick, thorny shrub and it was hard to even get close enough to read the inscriptions. The gray stone column covered with green spots of lichen and moss was from an era when the road was made for pedestrians. It is an old milestone but it has two ways to measure distance. On the side that is facing the road it says 22 miles to Kassel, 5 miles to Hanau. The German or Prussian mile of the 19th century was about 7.5 km, so the cities on the milestone were a good distance away. 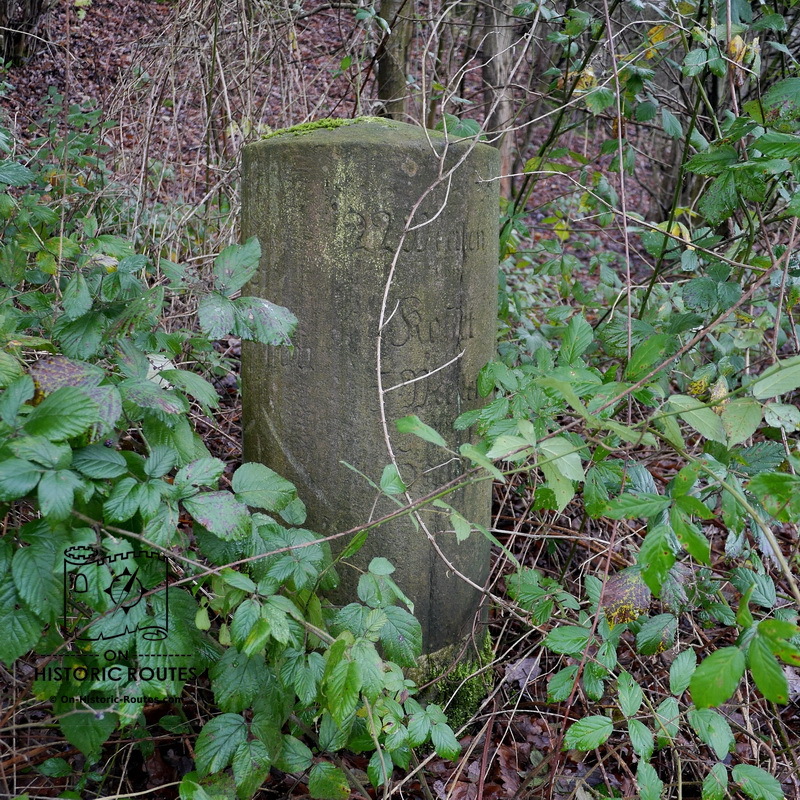 When you look at the milestone from another angle with your view along the road, there are more inscriptions. They are the reason, the stone is called Stundensäule, which means hour post or time stone. The inscriptions give you the distance to the next town in a different way. It says: Salmünster: 5/8 hours. That alone is not a way we think today. It translates to 38 minutes and naturally is for pedestrian speed – a reminder that this was the universal speed for centuries. It is interesting to note that it is neither 1/2 hour nor 3/4 hours but the more precise 5/8. The difference would be about 8 minutes. While this does not sound like a lot, it would be a 20 % difference, which also 200 years ago was not precise enough. Today we turn to our electronic devices if we want to find out the distance to a certain place. Doing so at the Stundensäule, Google Maps suggests 36 min for a route to Salmünster. What Google Maps does not know is that the road it suggests is not really suitable to walk on. Satisfied with my discovery, I turned away from the road and took a dirt track that led me into Salmünster.